A thick slice of doom for you guys. This is the first release from Serpentine Path who are composed of members from Unearthly Trance and Ramses so you know there's some talent behind this 7". Two tracks here just over six minutes a piece, and while admittedly it's nothing particularly jaw dropping or special it's definitely a solid offering of glacial paced doom. Both tracks are similar in feel and quite enjoyable, very to-the-point and do not meander as they've been paced and edited well. 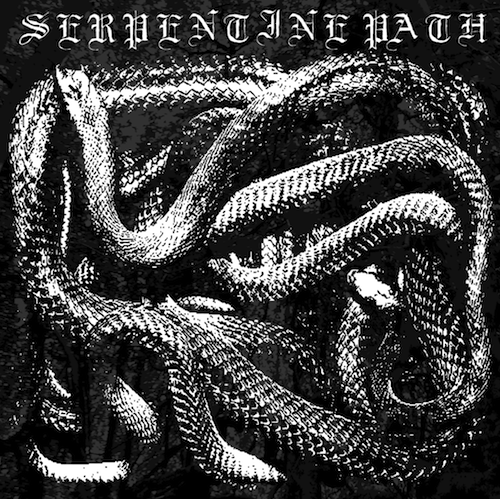 Serpentine Path's EP is made up of a thick guitar tone with excellent slow drumming — a steady clash of symbols, and echoing, deep gravelly vocals. In Eerebus a constant synth-like hum is floating behind the trudging grind, and a similar cycling noise can be heard near the end of Depravity; it adds much to the gloomy atmosphere. The riffs are well crafted grooves, a slow spiral downward eroding into darkness. There's only a few points where they break away from thunderous powerchords and hit single notes at a slightly faster pace (particularly in Depravity). A nice offering of doom indeed. This EP is limited to 500 and available at Parasitic Records, and you can follow them on their blog for further news.